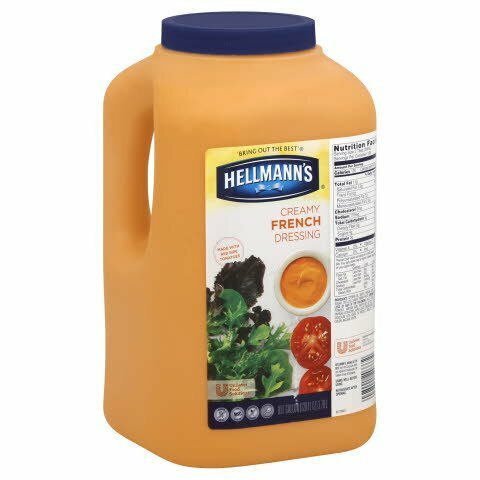 Perfectly balanced flavor makes this classic French dressing a popular favorite. INGREDIENTS: SOYBEAN OIL, WATER, VINEGAR (CORN SUGAR, CIDER VINEGAR, DISTILLED), SUGAR, TOMATO PASTE, CONTAINS 2% OR LESS OF EACH OF THE FOLLOWING: SALT, SPICE, ONION POWDER, XANTHAN GUM, PROPYLENE GLYCOL ALGINATE, PAPRIKA EXTRACTIVES, APPLE JUICE CONCENTRATE, CALCIUM DISODIUM EDTA (USED TO PROTECT QUALITY), CARAMEL COLOR, NATURAL FLAVOR. The Hellmann's name is recognized throughout the world for unrivaled quality and flavor. Hellmann's line of Blue Ribbon Collection Dressings offers premium quality with shelf-stable convenience. These dressings are also versatile, with alternative applications ranging from marinades and dips, to glazes and finishing sauces. Ideal for mixing with crispy fresh greens to create an innovative salad/salad bar.